2. Whisk together all rub ingredients. Sprinkle the rub mixture all over the tenderloin and use your fingers to massage into the meat. 3. Place tenderloin in skillet and allow to brown for 3-4 minutes, turning the meat throughout to sear on all sides. 4. Mix the glaze ingredients together and spread mixture over the tenderloin. Transfer to preheated oven and bake for about 20 minutes until cooked through. 5. Cut tenderloin into 1-inch thick slices. 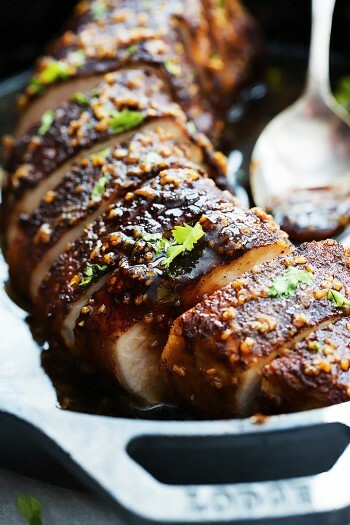 Use a spoon to drizzle the glaze from the pan all over the tenderloin just before serving.